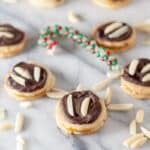 These Ischeler Tortelettes are a chocolate covered almond shortbread with apricot filling! The chocolate and apricot pair beautifully together! Another vintage Christmas Cookie in my collection, this one is Austrian. These Ischeler Tortelettes are a chocolate covered almond shortbread with apricot filling! Ischeler Tortelettes have such a gorgeous flavor and texture. Another cookie Mom and I have been making for eons are Ischeler Tortelettes. I literally have to threaten my teenagers with a swift death, if they steal any out of the freezer! There is a really good reason for that! Read on! I recall one year when my eldest son was in high school, I made a triple batch. Now keep in mind this took 12-15 hours to accomplish such a feat. I was running out of freezer space and being that it was very cold that year, I was using the front porch for added freezer space! The recipe we have is from a magazine recipe cutout from 1961. They are my favorite, along with both sons, my sister, one sister in law… Hence the reason we have to do the minimum of 4 different kinds! Everyone has a different favorite! Jam Filled Cookies, Christmas Cut Out Cookies and Hildabrötchen are the other 3. They are by no means difficult but they do take quite a while to make. For a single batch, about 4-5 hours depending on how big your cutter is. What are your favorite Christmas, or holiday cookies? I hope you enjoyed the post today for these delicious Ischeler Tortelettes! Give them a try and let me know what you think! Vintage Austrian Christmas Cookies are a family favorite! Cut 1 cup butter in small pieces. Knead with hands until dough is very smooth and firm. Roll small parts of dough between waxed paper to 1/8″ to 1/4″ thickness; dough is easier to roll if it is left out of refrigerator for at least 15 minutes. Cut into 1″ or 2″ rounds. Bake cookies on greased and floured cookie sheets, or on parchment paper covered sheets, in moderate oven (350 F) 10 minutes, or until golden. Remove cookies carefully. Very thin cookies are fragile. After cooling, put two cookies together with jam in between, sandwich fashion. Melt chocolate and 1 tablespoon butter over hot, not boiling, water. Beat until smooth. If necessary, add more butter or up to 1 tablespoon hot water to achieve spreading consistency. Frost Tortelettes on top and sides. Decorate tops with slivered almonds immediately. while frosting is still soft. Cool thoroughly before storing. Will freeze up to 1 month. I didn’t know they were your favorite! I’ll send you some but you have to hoard them and not tell anyone else! LOL! Why did you make them, Shell? You’re such a good daughter! Keep the tradition going! You now have the recipe! They’re not hard. Give them a shot! These look great! Nice and easy as well as full of flavor! Thanks, Debi! Yes, they are not difficult at all! Ooh, such delicious little cookies. I love the combination of chocolate and apricot. So perfect for the holidays. Chocolate and apricot are one of my favorite combinations! Thank you Tara! Such a pretty cookie! I love that you used apricot. They look delicious. Apricot is one of my favorites!! Thanks, Ellen! Oh, one of my favorite flavor combinations! Definitely give it try! Thanks Aleka! Wow! These would be my cookie heaven! They’re beautiful and the combination of apricot and chocolate. That’s perfect. Yes, I can see these disappearing so quickly. Delicious. Thank you Michelle! They really are heavenly! They are definitely delicious, Gabby! But i totally wanted to kill him! Thanks!